There's a lot of fun to be had at ground level, but if you're after a good hideaway, sometimes you have to dig a little deeper. Literally. That's where a place called Ella comes in. 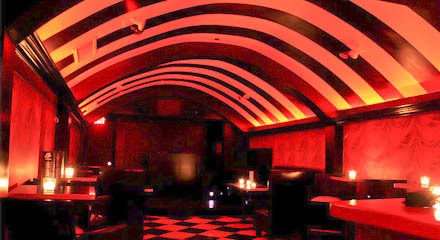 It's a speakeasy that's not a speakeasy but a glitzed-out ode to 1930s Hollywood glamour. We like the spot for a refreshment or two, but what we really like is the intimate venue hidden downstairs. The first-floor bar is a perfectly respectable lounge, but don't be fooled by the blinding metal chandeliers or the oversized Warhol perfume ads: The real scene flows downhill. Duck down the narrow staircase and, after a few twists and turns, you'll find yourself in an underground circus-style music parlor, complete with a big top domed ceiling, red-curtain wallpaper and a tiny little stage just inches off the ground. Swing by the bar for a Rye Smash and then join the fray of people around the stage drinking, dancing and reliving their carefree circus days. The stage is big enough for a drum kit and a piano...but maybe not both at the same time, so there'll be almost nothing between you and the band. As for the acts...well, there's nothing like a gamble. On a given night, you might find Regina Spektor stopping by for an unplugged show or a humble troubadour taking his first shot at the big time. We always said the best stuff was underground.